What Is A Bible Commentary? How Should Commentaries Be Used? What is a Bible commentary? Are they reliable or trustworthy to use? When we read the Bible, we can have complete confidence that it is God speaking and not man. The phrase “thus says the Lord” or “tell the people” appears over a thousand times in the Bible because it is God speaking through the authors of the Bible. Even when a prophet of God spoke, they never once spoke for themselves but only for God. The Apostle Paul knew that “All Scripture is breathed out by God and profitable for teaching, for reproof, for correction, and for training in righteousness, that the man of God may be complete, equipped for every good work” (2 Tim 3:16-17). All Scripture includes the Old Testament as well as the New Testament. The Apostle Peter would agree with Paul’s statement as he wrote that “no prophecy of Scripture comes from someone’s own interpretation. For no prophecy was ever produced by the will of man, but men spoke from God as they were carried along by the Holy Spirit” (2 Pet 1:20-21). Peter, and I believe the church, considered Paul’s writings as Scripture as Peter wrote of Paul’s letters or epistles, “There are some things in them that are hard to understand, which the ignorant and unstable twist to their own destruction, as they do the other Scriptures” (2 Pet 3:16) so clearly, Scripture includes the New Testament too. We trust the Bible over anything that anyone else writes but what about study Bibles or Bible commentaries? Can we trust them? First of all, study Bibles or Bible commentaries are not inspired by God. They might be written by inspired men who have the Spirit of God but that is never going to be equal to Scripture. It cannot override Scripture. It is only a man who writes and not God Who inspires the words. Their comments might be inspiring but they are not inspired. These commentators can be writing under the guidance of the Holy Spirit but their writings are not God-breathed like the Bible is. Commentaries are never “thus says the Lord” in value. 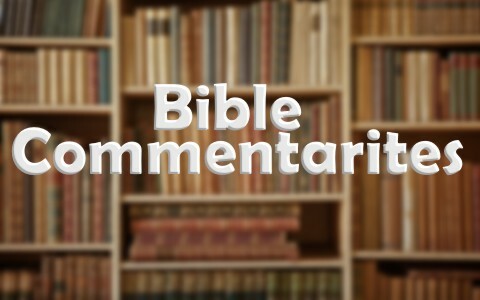 When you are not sure about a subject or need clarity or background on a verse or paragraph in a chapter, commentaries can be a great help in bringing understanding to the verses but their understanding can never contradict what the Scriptures say or you’ve got the wrong Bible commentary. If you’re not sure about a Bible passage and you don’t agree with or aren’t sure about a commentators comments, then it’s best to just wait, move on, or find a trusted Christian mentor, elder, deacon, teacher, or pastor. We should be satisfied on somethings to just say “I don’t know.” That’s okay. Are there some commentaries that are better? If so, which ones? I have three study Bible’s with commentary because I want to see how other men view certain passages and to see if I can learn something from them. They might have insight that I don’t have. They might have read something in the passage that I missed. Like the proverb that says “Without counsel plans fail, but with many advisers they succeed” (Prov 15:22) and in a similar manner, the wise counsel that is often found in study Bible’s or commentaries can help us make better decisions when the Bible appears to be silent on a particular subject. It’s a great idea for those who desire the office of a pastor, deacon, elder, or teacher to have as many Bible study resources as they can get like Bible atlas’, Bible concordances, Bible dictionaries, Greek or Hebrew lexicons, but also a study Bible or Bible commentary. Some call them study Bibles but they are usually the same thing since they have footnotes and comments concerning different Bible verses. Some study Bible’s or Bible commentaries might even include Scriptures to support the commentator’s comments. My first choice is the ESV Reformation Study Bible from Ligonier Ministries, editor, Dr. R.C. Sproul, who is one of the most trusted Bible scholars, theologians, philosophers, teachers, authors, and pastors of the last seventy-five years. Next is the ESV MacArthur Study Bible, which comes with a heavy dose from Dr. John MacArthur. The Charles F. Stanley Life Principles Bible is a very useful Bible full of daily applications for the believer. I also have a Chronological Bible with commentary and it puts all of the books in Chronological order or in the time sequence for when they were written. If you like Apologetics, you will absolutely love Ray Comfort’s The Evidence Bible. It is brim full of apologetic commentary but this Bible (KJV and NKJV) also presents a clear, precise presentation of the gospel that lets you use biblical methods of evangelism the way Jesus did, Paul did, Peter did, and all the authors of the Bible did. The Evidence Bible comes in the King James Version or the New King James Version. I also use the many online commentaries on the Internet that access men’s commentaries such as Matthew Henry, Charles Spurgeon, and even Martin Luther. Their commentaries are simply fascinating to me. They had such insight that few had at that time and indeed, few have today. I hope you can see the great value now in Bible commentaries or study Bibles. Whichever version you use, find a trusted author; read the comments, but ultimately, trust the Word of God. That is the only text in all of human history that cannot be burned, banned, or broken. The Word of God abides forever. Everything else will pass away before God’s Word ever does. Uh, I wouldn’t try holding your breath for that! Next post: What Is Spiritual Blindness?